Gourmet Kitty Productions offers unique, pop-up dining affairs inspired by global cultural diversity. We are passionate about bringing an intimate and ethnically inspired dining experience to the people we love most: the residents and visitors of the Truckee Tahoe area. Our monthly dinner events combine menus consisting of organic, locally-sourced, seasonal ingredients with live music and the visual arts to enhance the cultural theme du jour. Our goal is to create a fresh dining experience that is entertaining, thought-provoking, and communal. Most of all, we are passionate about using food and art as a catalyst to stimulate provocative conversation with diverse groups of individuals. We are skirting away from the fast-paced, impersonal restaurant, and providing a beautiful, engaging space where our guests can feel like they are at home and with close friends. Orin Sheldon, the brainchild behind Gourmet Kitty Productions, was tired of the turn-and-burn vibe at many busy restaurants and yearned for a more friendly and relaxed dining experience. His inspiration comes from his youth. In the early 1990s, his parents started an “International Dinner Club” with a select few of their closest friends. Gatherings were inspired by a cultural theme that extended far past the menu. Orin remembers a Native American dinner theme boasting a backyard sweat lodge, provided to enhance the cultural experience. While these experiences were often highly illuminating, his fondest memories are of watching his mom move around the kitchen in a Zen-like state, bringing together a complicated, multi-course meal with the fluidity of a cat. 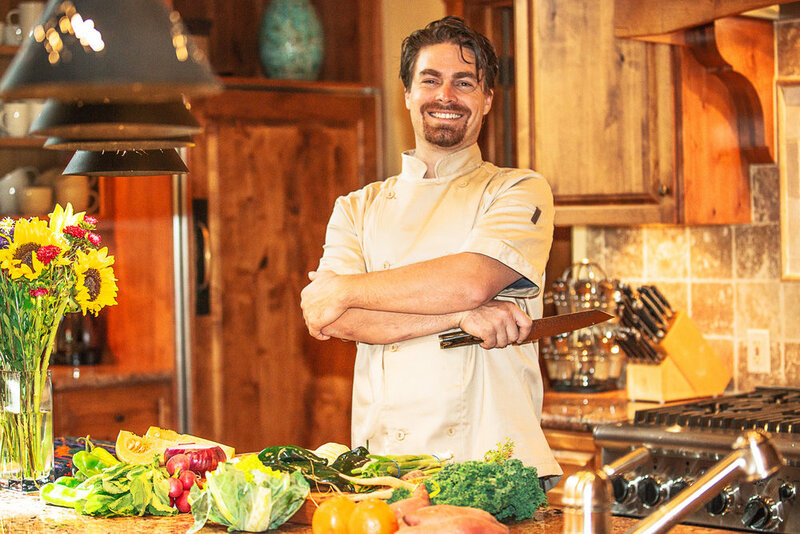 While restaurant work piqued his interest in the culinary arts, it was his time spent as a private chef for top CEOs and Fortune 500 members that really inspired him. He began hosting dinner parties for his various circles of friends, and this soon became a passion. A sense of euphoria would set in when he would step back to observe the lively atmosphere as acquaintances made connections over hand-crafted, organic cuisine. Watching people forge new relationships while developing a universal bond is what drives Orin forward in his entrepreneurial endeavor. Gourmet Kitty Production’s dedication to the local community stretches beyond the people who attend our events. We give back to local non-profits by offering beer and wine pairings in which all proceeds are given to the sponsored charity. We are happy to host private events such as engagement parties, birthdays, and other celebrations. We encourage full-immersion with the cultural theme. This is not a pretentious party; dress-up is encouraged! Have fun, meet others, and connect over fine, culturally-inspired cuisine, art, and music. We promise that it will be an experience you’ll never forget.